On display for the first time in the Museum’s galleries is the Portrait of Philip III by Velázquez, a work donated by William B. Jordan to the American Friends of the Prado Museum, which has ceded it to the Museum as a long-term deposit. Velázquez’s painting is displayed alongside the Prado’s Philip II offering the Infante don Fernando to Victory by Titian, which has very recently been restored (with the support of Fundación Iberdrola España). In the 17th century Titian’s painting hung in the same room (the Salón Nuevo in the Alcázar in Madrid) as The Expulsion of the Moriscos by Velázquez, a painting directly connected with the newly acquired portrait of Philip III, which was executed as a study for it. This donation and long-term deposit with the Prado will assist in completing the Museum’s presentation of Velázquez as a court portraitist. A work previously unknown to scholars, it casts new light on one of the key paintings produced by the artist during his early years at court: The Expulsion of the Moriscos. Also on temporary display are Philip III by Pedro Vidal; and Philip IV in Armour and The Infante don Carlos, both by Velázquez, thus creating a context for understanding the Philip III portrait and the reasons for its attribution to Velázquez (stylistic analysis, technical characteristics, and its relationship to The Expulsion of the Moriscos). The Portrait of Philip III is a previously unpublished work with stylistic features and technical characteristics that allow it to be attributed to Velázquez and to be associated with The Expulsion of the Moriscos, a work painted in 1627 in competition with Vicente Carducho, Eugenio Cajés and Angelo Nardi. It was lost in the Royal Alcázar (Madrid) fire of 1734, but descriptions of it survive confirming that the principal figure depicted in it was Philip III, shown standing next to an allegory of Spain and pointing towards the Moriscos as they were being expelled. Velázquez never met Philip III, who died in 1621, and he based his work on portraits of the monarch by other artists. This canvas is a preliminary study that he used to establish an image of the King, thus explaining its sketchy nature as a working tool rather than an independent, finished work. The recent restoration of Titian’s Philip II offering the Infante don Ferdinand to Victory, has recovered the qualities of Titian’s original, but has also made Carducho’s enlargements more visible. This is particularly evident in the architectural elements; and in the inferior quality blue pigments that Carducho used, resulting in a different aging process and making his modifications visible. Following the current display, the canvas will be shown with Carducho’s additions concealed. This entry was posted in Museo del Prado and tagged Madrid, Museo del Prado, Prado Museum, Velázquez on June 14, 2017 by Clare Hills-Nova. Deadline: Friday, 18 March 2016! La Escuela Española de Historia y Arqueología en Roma-CSIC y el Museo Nacional del Prado comienzan una colaboración científica para promover iniciativas dirigidas a jóvenes investigadores en los campos de la Historia, la Historia del Arte y las Ciencias Humanas. La primera de ellas es la organización de un Taller dedicado a las Geografías de la pintura barroca, un encuentro entre especialistas de este campo y jóvenes investigadores que tendrá lugar en la Escuela Española de Historia y Arqueología en Roma entre los días 10 y 12 de mayo de 2016. This entry was posted in Uncategorized and tagged 2016, Baroque art, Escuela Española de Historia y Arqueología en Roma-CSIC, Museo del Prado, Prado Museum, Rome on March 16, 2016 by Clare Hills-Nova. Museu Nacional d’Art Catalunya, Barcelona, 16/06-16/09 2016. 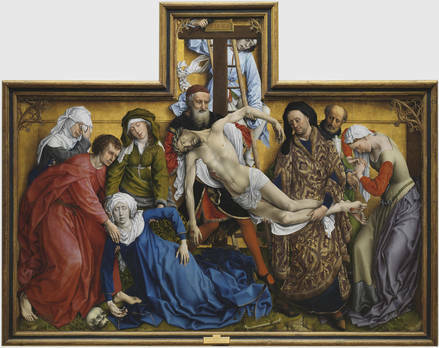 Nineteen works owned by the Prado, including the Christ on the Cross and the Resurrection gifted by Plácido Arango, plus 35 from national and international museums, private collectors and religious institutions. Works include the Virgin with the Little Bird from the parish church of San Agustín in Madrid, the Virgin and Child with the Infant Saint John from the New Cathedral in Salamanca and the Ecce Homo from the Museu Nacional de Arte Antiga in Lisbon, which was recently restored in the Prado workshops. This entry was posted in Spanish Art and tagged 2015, 2016, Bilbao, Exhibitions, Luis de Morales, Museo del Prado, Prado Museum, Spanish Art on December 23, 2015 by Clare Hills-Nova.